Historical legends in racing take on a mystical quality over time. Exterminator was foaled one hundred and one years ago and much has been written about his legend. He was from a bygone era when horses raced more frequently and for longer careers. There were many prestigious races that were longer in distance than today. Soundness was vital to the champions of the time. Soundness and an iron constitution were the hallmarks of Exterminator’s career. He made one hundred starts over a career that spanned eight years. One of the mystical stories to his legend is that some record books disagree with his one hundred starts. Many records show him to have started in ninety-nine. The debate is a mute point. For the sake of one race, Exterminator still averaged more than twelve races a year. That is more than an entire career for many modern champions. Exterminator won fifty races, which is in every record book regardless of the number of starts. He won many of the more important races of his time and defeated many of the era’s divisional champions he faced. As the wins piled up and his fame grew, Exterminator became a household name in America. Fans flocked to the races in which he entered and he became one of the first true superstars in the sport. However it did not start out that way from the beginning of his story, he had to earn his place in history. Exterminator was foaled in Kentucky at Almahurst Farm just outside of Lexington. His breeder of record is F.D. Knight who sold the chestnut colt the following year at the Saratoga yearling sales to J. Cal Milam for $1,500. Exterminator was a big gangly colt and was not a very attractive individual as a yearling, but his pedigree is a very interesting one. The sire of Exterminator is a horse named McGee. McGee was an under appreciated imported English bred stallion who had already sired the 1913 Kentucky Derby winner Donerail. McGee was consistently in the top twenty on the American sire list during his career, and this was during the time of legendary stallions such as Hastings, Fair Play, Broomstick, Commando and Peter Pan. McGee would eventually sire twenty-nine stakes winners which is nine percent of his total foals. The sire of McGee was White Knight, who was sired by Epsom Derby winner Sir Hugo. White Knight sired only one horse, McGee, before he was gelded. The dam of Exterminator is Fair Empress a daughter of Jim Gore who in turn is a son of the great champion and sire Hindoo. Jim Gore was a stakes winner and had finished second to Montrose in the 1887 Kentucky Derby. Fair Empress made only two starts and never won a cent. Her second dam Raybelle was by major stakes winner Rayon d’Or (St. Leger Stakes, Champion Stakes, etc). Exterminator was thus inbred 5×5 to English Triple Crown Champion Blair Athol. There was some class to the pedigree of the McGee – Fair Empress colt, but not what would be called substantial class. Due to his size, Exterminator was slow to develop. Milam had him gelded for reasons that are unclear today. Some reports say he was incorrigible, some say it was due to Milan’s lack of faith in the pedigree, and some say it was due to Exterminator being a rather ungainly looking large steed. There are various conflicting reports of his actual height. It has been reported that Exterminator was as large as 17.1 hands tall, but most reports claim him to be 16.3. Regardless of the reason, Exterminator would have to live the rest of his live without the possibility of becoming a sire. More fuel to the legend’s mystique. Milan was also the trainer to Exterminator and he sent him out four times, a very small number back in the day, as a two year old. The gelding won two of these races, his first start in a maiden allowance and one more in allowance company. Three of his two year old starts came in Windsor Canada, with none of the races being beyond six furlongs. During the early spring of 1918 Milan sold Exterminator to trainer Henry McDaniel acting on behalf of Willis Sharpe Kilmer for $9,000. The purchase was made to provide Kilmer’s champion two year old from the previous year Sun Briar a work mate to prepare for the Kentucky Derby. Kilmer was not impressed with his new stable acquisition, calling him a truck horse or that goat to anyone who would listen. However McDaniel was very impressed with Exterminator. Accessing the work outs of Sun Briar and Exterminator, McDaniel saw how his new charge was simply toying with his reigning champ. Sun Briar did not make it the Derby due to ringbone, so McDaniel wanted to start Exterminator in his place. Willis was not very keen on the idea but allowed the entry to be made after considerable persuasion. Kilmer did however steadfastly refuse to watch his billy goat in the race. The track on Derby day was a deep muddy surface after heavy early morning rain. Despite not having run beyond six furlongs and making his three year old début, Exterminator won the ten furlong Kentucky Derby as a 30/1 long shot by a length over Escoba. Kilmer was as shocked as the rest of the people in attendance who had no faith in the horse. McDaniel was not. He was proud of Exterminator and justifiable so. He had faith and his faith would reward him countless times more in the future. The press and fans alike did not know what to believe. Is the Derby winner a flash in the pan or do we have a new star on the horizon. The next few races would not provide any definitive answers. Three consecutive second place finishes and a twelve length shellacking by stable mate Sun Briar in the Travers pointed to the flash in the pan theory. After a troubled third place in the race following the Travers, Exterminator began to get it in gear and won five of his next nine races, with three seconds and one third. He won at distances ranging from eight and one half furlongs to eighteen furlongs. Exterminator ended his three year old season with seven wins from fifteen events, finishing second four times and third three times. His final nine races came in an eight week span during October and November of 1918. Exterminator won five stakes races during the year. He ended the year with two decisive wins at Latonia. Perhaps Exterminator’s Kentucky Derby was not a fluke after all. McDaniel gave him a four month rest until his first start in 1919. The proof as they say is in the pudding. Exterminator was beginning to put it all together during the latter half of 1918, so McDaniel prepped his emerging star at Oaklawn Park in Hot Springs Arkansas and sent him out for a pair of handicap wins in late March to begin his four year old campaign. Exterminator returned to Kentucky in May and won the Ben Ali and Camden Handicaps at Lexington to run his win streak to six. McDaniel kept Exterminator in Kentucky and sent him to the post three more times at Churchill Downs during the month. He won once and placed in the money in the other two races, conceding considerable weight in each race. In his win, the second placed horse Flyaway ran with thirty-seven pounds less than Exterminator. Moving on to New York, the big gelding ran fifth in the Suburban and Excelsior Handicaps. McDaniel decided to give him a breather. Six weeks later Exterminator was at Saratoga and made four starts, all in handicaps, during the month of August. He did not win the first three but one could see him returning to his top form as he placed in each race and was only beaten by a combined three lengths. His fourth race during this Saratoga meet came in the one and three quarter mile Saratoga Cup. This race was one of the highlights of the racing calendar back then. In a torrential downpour Exterminator led all the way and won by one and one half lengths on the sloppy track, equaling the track record. Exterminator at this point was still not the big fan favourite. A new star had emerged by this time in the two year old division. This colt in question looked the part of a champion with his powerful build, his bright chestnut coat and his devastating turn of foot. The colt’s name was Man O’ War. The lanky somewhat old looking Exterminator was not only accumulating wins but also accumulating nick names. We have already seen the disparaging names from his owner upon first sight, but newspaper reporters were issuing names like “The Abe Lincoln of Racing” and “The Galloping Hatrack” among others. The stable lads dubbed him “Old Shang”. Later he would receive the nick name that became synonymous with him, “Old Bones”. By now Kilmer was thoroughly enjoying his success with Exterminator, but he still considered Sun Briar as his top horse. A three race stint at Havre de Grace in Maryland would see Exterminator finish second in the Hartford County Handicap to The Porter, win the Republic Purse and then finish second by half a length to Cudgel in the Havre de Grace Handicap. Exterminator gathered more admirers from this race. Not only was Cudgel considered as a top class runner, but also in the race were Sir Barton, The Porter, Sun Briar and Midway. Exterminator was impeded by a tiring horse with two furlongs to go, forcing jockey Willie Knapp to check his mount, and then regained his composure to take a second run at the leaders. Turf writer Charles Hatton was there that day and wrote ”In a few more strides, Exterminator would have been the winner”. Hatton also gave him another nick name, “Stermy”. Exterminator made five more starts to complete the season, winning two and placing in two. He ended the year on a high note with a dominating four length win in the Pimlico Cup Handicap, setting a new track record of four minutes and thirteen seconds for the eighteen furlong race. The year end totals were nine wins from twenty-one races, with six second places and three thirds. In stakes races Exterminator won five, was second in five and third in three. Changes were in store for Exterminator over the off season. Willis Kilmer and Henry McDaniel parted ways. Kilmer hired J. Simon Healy to take over his entire stable, including the big chestnut gelding. Six months after his last start in 1919, Exterminator began his 1920 season at Belmont. On the same day when Exterminator reappeared to racing, Man O’ War was entered in another race on the card. Man O’ War pulverized the field in the Withers Stakes, while in the next race Exterminator was just caught at the finish line by Alibi in the Elmont Handicap. This was the first race in six months for Old Bones and he was conceding twenty-one pounds to the winner. With Sir Barton still in training, the emergence of Man O’ War and the gradual but steady momentum of fan following for Exterminator, racing entered a golden age. There was a steady debate of who is the best in the press and from race fans in general, leading to speculation of a meeting between the three. Alas, the dream three cornered matchup never took place. Exterminator had already met Sir Barton the year before and beat him, but Sir Barton would return the favour later in this year. However, Exterminator and Man O’ War would never start in a race together. Sir Barton and Man O’ War did famously run in a match race later in 1920 at Kenilworth Park in Windsor, which Man O’ War won. 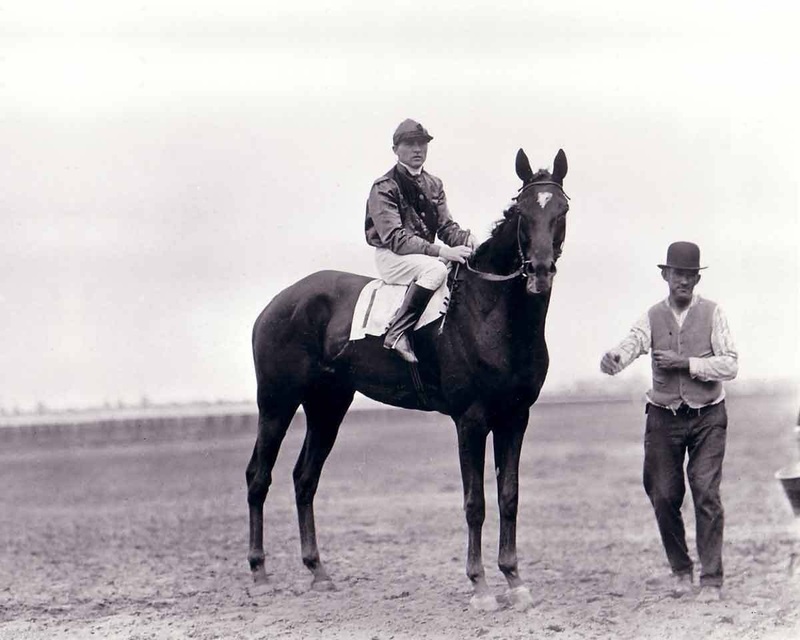 Exterminator’s five year old campaign in 1920 established him as one of the all time greats. Old Bones needed a few races to reach his peak, but when he did he was almost unstoppable. His second start saw him finish third in the Suburban Handicap, and then he won the Long Beach Handicap, finished fourth in the Brooklyn and won two more Handicaps during a six race stint at the New York area tracks. Healy took Exterminator to Windsor where the gelding finished third in the Frontier Handicap and then back to New York for the Saratoga Handicap. This was the race where Sir Barton got his revenge over Exterminator with a two length victory. Old Bones followed this with another second in the Champlain. Back to Windsor we go where Exterminator initiated a six race winning streak. The first win in the streak came in the Windsor Jockey Club Handicap, followed by the George Hendrie Handicap. It was back to Saratoga where he defended his Saratoga Cup beating champion filly Cleopatra over a quagmire of a race track. Exterminator stayed in New York State and won the two miles long Autumn Gold Cup at Belmont to continue his streak. But more changes to his daily routine were to come. This was the last race in which Simon Healy would saddle the big gelding. Will McDaniel, brother to Henry, became the new conditioner for the Willis stable. McDaniel immediately brought Exterminator north of the border to Woodbine in Toronto for a pair of lucrative handicaps. His new trainee won both the Toronto Autumn Cup and the Ontario Jockey Club Cup to run his streak to six. Will McDaniel then brought Old Bones to Maryland and started him in two more races. Exterminator was somewhat flat in a fifth placed performance in the Bowie Handicap, but regained his winning form to close out the season with a nose victory over Boniface in the Pimlico Cup Handicap. The final tally for Exterminator’s five year old campaign was; seventeen starts, ten wins of which nine were stakes victories, three second place finishes all in stakes, and two thirds both of which were stakes. He won seven of his final eight races, and since Man O’ War and Sir Barton were off to stud, he became the top drawer horse still racing. If 1920 established Exterminator as a bona fide hero, then 1921 would cement his place in history as one of the true turf greats. It would be an unusual season for our hero as he had three different trainers during the year, travel to nine different tracks and have six different jockeys pilot him in his sixteen race campaign. Exterminator took everything in stride and would exhibit his considerable intelligence in getting through such a diverse array of changes to his daily routine. As with the previous campaigns, Exterminator took his time to get into the swing of things. For his first five races he was saddled by Will McDaniel, winning the Long Beach Handicap and placing in three other handicaps. In each race Old Bones was the high weighted entrant. F. Curtis then trained him for his next three races, winning the twelve furlongs Independence Handicap and finishing in the money the Daniel Boone and Frontier Handicaps. Willis Kilmer then hired former jockey Will Knapp to train his stable. Knapp had steered Exterminator to many of his important early career victories, including the Kentucky Derby. Knapp had weight battles throughout his riding career and finally decided to hang up his tack and turn to training. Kilmer had him under contract as a rider for many years and it was Knapp who rode Kilmer’s favourite Sun Briar to every one of that horse’s wins. Knapp got off to a great start with Exterminator winning the first four races in which he tightened the tack. The first two wins came at Saratoga in the Merchant & Citizen’s Handicap and the Saratoga Cup, his third successive victory in this event. Exterminator then won his second successive Autumn Gold Cup at Belmont and in keeping with defending titles, his second successive Toronto Autumn Cup at Woodbine. Old Bones won the later race carrying 137 lbs. Knapp brought Exterminator back to Maryland for three more races, with a side trip to Lexington for one race, to complete his 1921 season. Old Bones won an overnight handicap and completed his year with a successful defence of the Pimlico Cup. Two of the top handicappers campaigning at the time were constant rivals in Toronto and Maryland in the form of Boniface and the outstanding mare My Dear. The latter finished just ahead of him in the Annapolis Handicap, which was won by The Porter, but Exterminator defeated her and Boniface in four other races. Exterminator raced against a very classy group of handicap horses during the year. The likes of The Porter, Boniface, the mare My Dear, John P. Grier, Mad Hatter and the top three year old Grey Lag were all established and classy racers. Exterminator gave substantial weight to each one and did not beat them every time, but he did beat them enough to be named as the Champion Handicap Horse of the Year. Grey Lag was named as Horse of the Year. Since there was no official award back then, these titles were given from a series of polls conducted by various turf publications and writers. To bring you up to date, Exterminator started sixteen times in 1921, winning eight, finishing second twice and third five times. Seven of his wins were stakes victories. Willis Kilmer decided over the course of the winter to split his sable between two trainers. Knapp assumed that his portion of the stable would include Exterminator, but Kilmer was hesitant to commit the champion quickly enough for Knapp’s liking. Knapp quit in protest. Kilmer then hired Eugene Wayland to become the seventh trainer Exterminator had had so far in his career. Wayland had Exterminator ready for his seasonal début in the Hartford Handicap. The big seven year old won his first start of the season for the first time since his Kentucky Derby triumph four years earlier. In the race he defeated Commander J.K.L. Ross’ top sprinter Billy Kelly by a length over six furlongs of heavy going. Boniface would hand Exterminator a nose defeat in the next race but Old Bones returned the favour with a head victory over his rival in the Palm Springs Handicap at Pimlico. The Pimlico win touched off a six race winning streak that would include the Clark, the Kentucky and the Brooklyn Handicaps. In the latter race he defeated Grey Lag, conceding nine pounds to that rival. Exterminator was by now carrying no less than eight pounds more to his nearest competitor. Such was his reputation. For the Independence Handicap on July 4 at Latonia, Old Bones was assigned 140 lbs. He finally succumbed to the impost demands made of him and finished a well beaten sixth. His next race was not much better as Grey Lag carrying eight less pounds won the Saratoga Handicap some ten lengths in front of fifth placed Exterminator. Gene Wayland then decided to find his gelding a weight for age race to renew his gelding’s winning ways. Wayland found his answer in the Saratoga Cup, the same fourteen furlong race that Exterminator made his own for the previous three runnings. Leading all the way, Old Bones held off a determined Mad Hatter to win his fourth consecutive cup by a neck. The following race was another well known to Exterminator race as he carried 132 lbs to a one and one half length victory for his third consecutive Toronto Autumn Handicap. He gave the runner up Guy thirty pounds. By now, fans of Exterminator were getting despondent with Willis Kilmer for his insistence in running the beloved champion so much. “What more does he have to prove” was the cry from the fans. Legendary turf writer Joe Eastes was in the fans camp and wrote an eloquent poem to the effect. Following the Toronto win, Kilmer received an invitation to bring Exterminator to Chicago to run the gelding in an exhibition against the clock. There was no purse to be had. Wayland was very reluctant to go as the track, newly re-opened Hawthorne, was not yet in good enough condition for his liking. Exterminator went and ran a pedestrian ten furlongs under Wayland’s orders, so as not to tempt any harm to the horse. This is the race that is disputed to this day as to being included in the final totals of Exterminator’s career. Exterminator made four more starts before the end of the season, winning the Laurel Handicap and finishing third in the Pimlico Cup. In the latter race he conceded twenty pounds to the winner Captain Alcock. The final totals to his seven year old season were; sixteen official races, ten wins, eight of which were stakes races, one second and one third. Exterminator was named as the unofficial Champion Horse of the Year and Champion Handicap Horse from the various polls of the day. Willis Kilmer was by now obsessed with passing Man O’ War’s earnings record, and he wanted Exterminator to go beyond the mark. Old Bones was less than six thousand dollars behind. So the reigning champion was to be brought back for another campaign. Unfortunately, Gene Wayland passed away from a severe heart attack on March 9, 1923. Exterminator would now be conditioned by the eighth trainer in his life, Canadian William Shields. Old Bones made only three starts, all within twelve days at Havre de Grace during the month of April. Exterminator finished third in the Hartford, won the Philadelphia Handicap and was nosed out for victory in an overnight handicap. The popular gelding came back to the barn lame. The public outcry for his well being had more fuel to argue the point. Old Bones did not race again that year, and to complicate matters William Shields passed away in September. Kilmer wanted to keep Exterminator in training to attempt a run at the earnings mark which was now set higher by Zev who had passed Man O’ War on the list. The deficit was $53,000, which a younger Exterminator could have passed with ease, but he would have to now do so as a nine year old. Kilmer needed a trainer. He was notorious for changing trainers as often as most people change their socks, but he was a charismatic man who could persuade people. Kilmer smooth talked Henry McDaniel into coming back and training Exterminator. McDaniel was very reluctant to work for Kilmer, remembering the difficulties he had a few years before with the eccentric owner. But McDaniel still had great affection for Exterminator and agreed to condition the ageing star. McDaniel was training some of Commander Ross’ horses at Tijuana where a lucrative race called the Coffroth Handicap was run in March. Kilmer wanted Exterminator to run in this race. Henry McDaniel started Old Bones in an allowance race, which he won, six weeks prior to the Coffroth. Carrying 130 lbs, Exterminator just did not have it as he finished a tired fourth in the main event. Exterminator came back to Maryland three weeks later to win another allowance race and then two days after that finished fifth in the Philadelphia Handicap, followed by a third in the Merchant’s Handicap at Pimlico. McDaniel could see that Exterminator just could not keep up like he used to. The wear and tear was evident on the old warrior. Kilmer was adamant that Exterminator stayed in training. McDaniel quit in protest. John I. Smith was given the unreasonable task of trying to get Old Bones to win enough money to set the all time record Kilmer coveted. Smith took Exterminator to Montréal and started him in a one mile allowance race at Blue Bonnets Race Track. Canadian turf icon Commander Ross had a very good four year old named Golden Rule in the race, but Old Bones reminded everyone that day of what a champion is capable of. He won the race in a display of grit and determination that hearkened back to his glory days. Moving over to Dorval Park just outside Montréal for the Queen’s Hotel Handicap two weeks later, Exterminator faced the very good handicapper Sport Cash. In what was to be the final race of his distinguished career, Old Bones gallantly ran third under extreme duress. He crossed the finish line and pulled up lame immediately. He was not seriously hurt but his racing days were now behind him. Exterminator was retired to Remlik Hall, Kilmer’s training facility in Virginia. Exterminator was a gentle giant and very intelligent. He was smart enough to recognize bad actors at the start of races, and would lean on them to keep them still and prevent them from holding up proceedings. When he saw a camera, he would pose until the picture was taken. He was trained by no fewer than nine trainers, adapting to new routines every time. He was ridden in races by eighteen separate jockeys, adapting to differing riding techniques. He enjoyed the ovations he received and acknowledged the crowd when he came to the winner’s circle, and when he was in the pre-race paddock preparing to compete. Old Bones had a small best friend in the form of a Shetland pony named Peanuts. The two were inseparable. There was in actuality three pony friends named Peanuts during Exterminator’s life. When the first two died, the normally affable and gentle Exterminator would be inconsolable. He would rant and rave in his anguish until a new pony could be found to calm him and become his new companion. Exterminator was relocated during his retirement to Kilmer’s Sun Briar Court in Binghamton New York. He would live the rest of his life here. School children passing by his paddock routinely stopped to pet him and bring him treats. Wallis Kilmer’s wife Sarah encouraged the children and would organize birthday parties for “Slim” as she called him, for the children to attend. Exterminator seemed to enjoy these moments as much, maybe more, than his human friends did. On September 26, 1945 Exterminator passed away from a heart attack at the age of thirty. He was buried in a pet cemetery just outside of Binghamton beside his old stable mate Sun Briar. Never had one horse stirred so much affection from people as Old Bones did. His passing made national headline news. He was viewed as the indestructible one due to his long career on the track and his outstanding ability to overcome the most incredible conditions any horse has ever had to overcome. He did so with class, intelligence, stamina and indomitable spirit. Exterminator was an extraordinary horse. In the opinion of many, the most extraordinary horse to ever live. As a child, I read a book called “Old Bones” which is Exterminator’s story. Thank you for reminding me about this exceptional horse! I shall have to find the book and read it again! I have read many stories about Exterminator all my life. This story is the most complete and easier to read than any other i have read. A great story about a great horse. I love to read about the great horses from the past. Makes me wish i had been there to see them.